Walnuts Benefit for Skin. Walnuts are an amazing source of many nutrients and minerals that strengthen and fortify skin cells and make it look younger and brighter. Loaded with potassium, omega 3 and 9 fatty acids that give a flawless and ageless skin; including them in your regular beauty care regime can give you the skin of your dreams. Read following natural beauty tips. Walnuts are consumed in almost every part of the world and are versatile in their usage. Apart from directly consuming, they can be used in various face masks and packs that have an equal positive effect for the skin. Many cosmetic companies use walnuts in creams, lotions and scrubs but when there are natural and organic ways to use the dry fruit, why bother with chemicals. 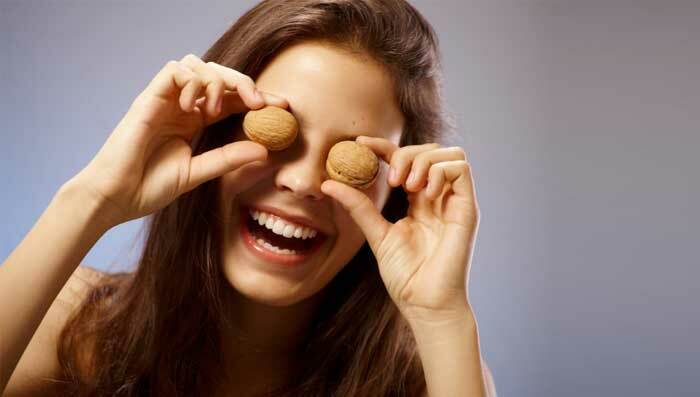 Walnut benefits for skin are immense and being high on antioxidants, keeps the skin healthy and flawless. Few of the advantages of using walnut are listed below. Walnuts are rich in polyunsaturated fats that holds the key to combating the signs of ageing and giving you younger looking skin. For those looking to ease away signs of aging and wrinkles, walnut oil is the best solution. The oil is absorbed by the inner layer of skin and makes it soft while making lines and wrinkles and other signs of ageing disappear over a period of time. Walnuts are good for combating a host of skin related infections and conditions that give rise to acne, pimples and irritation on the skin. Walnut oil for skin is amazing as it fights off bacterial and fungal infections, keeping acne and pimples at bay. With its regular usage, the antioxidants in walnuts will aid in cleaning the skin’s surface of any free radices and harmful toxins and wash off excess skin oil. As you grow older, your skin starts getting exposed to a plethora of issues and if not controlled in time, there are chances that it may eventually succumb to them. Result- dull, dry and lifeless skin. So the easiest way to get rid of common skin problems is by using walnut face scrub that washes off all impurities, leaving behind a youthful, clean and glowing skin. Walnuts are a great source of antioxidants and helps fight off impurities while healing the skin. The wonder nut that it is, it helps fight off free radicals that eventually damage the skin cells beyond repair and causes diseases like skin cancer. The polyphenols in walnuts help in making skin flawless and blemish free.